Crystal Rasmussen is a Generational Healer™ and Spiritual Guide who supports you in clearing past generational trauma and wounds within your genetic lineage through an ancient healing technique from your ancestors to release pain and trauma stored within the memory of your DNA to heal you today. Crystal travels from her home base in Sidney, MT sharing this sacred work with other communities. For more information visit www.CrystalRasmussen.com. to move in a positive direction and face the challenges from past trauma to future positive connection. In each readying you will receive a detailed and highly accurate insight that covers the aspects of your life where you feel you need the most connection. Todd Kintz is a 3rd Degree Wiccan High Priest, medium and clairvoyant. He has been providing clarity in all areas of life through the tarot, pendulum, runes and past life exploration since 1989. Glenda Brauneis is an intuitive palm reader with over 20 years experience. 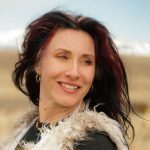 She was first trained in the art of Palm reading in Washington D.C. and has continued to learn and grow in the art as she’s traveled and lived all over the U.S.
Red MoonEagle is a shamanic healer, astrologer, teacher coach and energy worker. Using Tarot she assists you in finding clarity in your situation as well as provide options for growth. MoonEagle helps clients understand the web of life and assist them in fulfilling their purpose in life. She guides them to harmonious acceptance of their work and the choices they have made and or need to make. Each session is packed with information, and clients are encouraged to bring pen and paper. Kelley Partridge Intuitive Artist will be available to adorn you with Intuitive designs, with henna, at Barjon’s! Kelley is a self taught artist who loves to create. See more of her work and info on henna at kelleypartridgeintuitiveartist.com. PLEASE NOTE: This schedule is subject to change. We encourage you to call to reserve an appointment with readers. Thank you!